This 1/96 scale addition to the Compact kit range is the H.M.S. ROYAL MARINE in her outfit after her service in WW11. She was converted to a working trawler a fairly major conversion as she was stripped down to her bare hull and rebuilt, after which she was based in Fleetwood for a number of years. The military class of Naval Trawlers were constructed by Cook Welton & Gemmel ltd of Beverly who launched 75 Trawlers to Royal navy designs based on commercial ships. 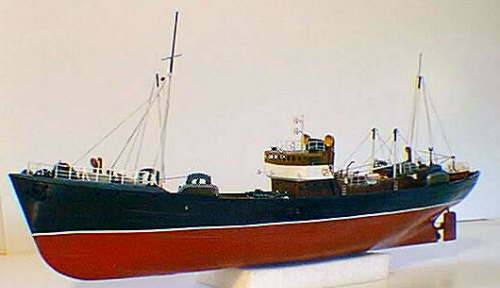 The Royal Marine was ordered on 20-3-43 as part of the 43 Trawler programme.